In addition to learning about healthcare and medicine, the students of the Karabots Junior Fellows Program have been learning about different perspectives on living in Philadelphia. Recently, they took part in a set of field trips to learn about urban planning and design in the city, as well as getting the opportunity to connect with Philadelphia college students. For two sessions the Fellows met with Michael Nairn, Professor of Urban Studies at the University of Pennsylvania, and his undergraduate Urban Studies class. During the first session, they traveled to Dilworth Park, the public park surrounding City Hall. There they met with Susan Weiler, who headed the team that designed the park. Susan offered her unique perspective on the development of a public space, going into detail about the decisions that motivated the creation of Dilworth Park, as well as insights into the field of architecture. Michael challenged both his students and the Fellows to think about the definition of “public space” and the social, economic, and political negotiations that term entails. The following week, the Fellows traveled to Penn to meet with Michael and his students at their class. It gave the opportunity for them to connect with college students in a real class environment. 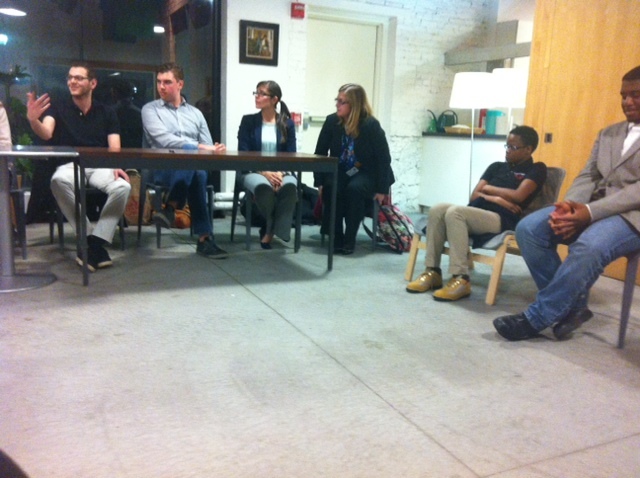 The Fellows and students broke into groups to discuss what they had learned at Dilworth Park; however, conversations quickly turned to sharing experiences: life in college, living in Philadelphia, and other interesting topics. It was a great opportunity for the Fellows to get a sense of what to expect during their future academic pursuits. For better or worse, “professionalism” is often required to get the things we need: a job, a paycheck, and housing. However, if we see it for what it is (a means to an end, rather than something to adopt, internalize, or assimilate into), we can find and create spaces which are comfortable and get us what we need. For example, one of our students who identifies as agender and non-binary described how slacks and a colorful scarf help them maintain a comfortable gender expression without offending anybody’s sensibility around “professional” expectations. This is necessary in situations where acting “professional” might affect your access to resources or employment. We had a panel of people who work in human resources, admissions committees, and in the STEM field talk to us about professionalism as they relate to queer and trans issues. Emma Grigore from Wharton Human Resources at Penn, talked a bit about ‘networking.’ This is something we get stuck on a lot. People sing the praises of networking, and one poll found that 80% of today’s jobs are filled through people’s personal and professional connections. However, this only works well if you have a resource-rich network. By definition, marginalized communities are going to be at a disadvantage in their ability to access certain networks, so Emma emphasized how important it is to advocate for yourself! Being your own advocate means asking for help when you need help. It means recognizing opportunities that people around you can help you access, and actively pursuing them. Hustle! Maybe someone whose work you admire needs an assistant, or maybe their organization will have a job opening in the near future. Maybe you can volunteer for an organization, which can often create a stable structure for seeking mentorship and having a more direct line to information about more opportunities in a field that interests you. Volunteering is a great way to build relationships (and those relationships become your network). Be polite, but have no shame! You might send many emails that go unanswered, you might have conversations with people who just smile and shoo you away, but if you know what you want, asking the right person the right question can open doors for you. There is no magic to this, there are no guarantees, but luck favors people who are prepared. You should read as much as you can about the field you’re interested in. This will make you more confident in engaging people in conversations about your interests, and it will show people that you are passionate. (Being your own advocate also means knowing your rights and how to defend them, more on that later). In discussing interview etiquette and expectations, Quincy Greene from Q Spot Philly made an important point: “If you don’t know what’s expected of you, then ask!” Do I need to wear a tie? Where can I wait if I arrive early? Asking questions doesn’t make you sound ignorant, it means that you are conscientious and thoughtful. If a young person asking questions is met with impatience or nastiness, that is a SURE sign that this will not be a supportive environment in which to work or learn. A lot of the advice you’ll get about finding a job applies to getting into college. Amy Smith, who reads applications to the University of Pennsylvania, discussed some of what admissions committees are looking for. These ideas apply to most college admissions processes: Can they demonstrate that they’ve done their research about the school, and that they’ll make use of the school’s resources? How does your passion show up in the world? What impact might you have on the campus and more broadly? In terms of concerns for queer and other marginalized students, Amy said that experiences of adversity demonstrate resilience, and while there are no expectations, or at least there should not be any expectations that a certain person have a certain experience, surviving in the face of adversity can only be interpreted positively. Michael Nairn, a professor of Urban Studies at Penn, also stressed the fact that, there is always some luck and bias involved. It’s best to enter any application process with the expectation that you’ll often get rejected, and sometimes you’ll get accepted. Knowing that some people, employers, or organizations will see your value and that others will not is all the more reason to put out an authentic representation of yourself, and to set boundaries that keep you feeling happy and safe. No one should ever make you feel like you can’t be “out,” and equally, no one should make you feel like you have to be “out” or identify yourself in any pre-prescribed way. Our identities are processes, and we are all constantly renegotiating them in order to stay safe and get our economic, emotional, and spiritual needs met. So, returning to the idea of being your own advocate: this also means knowing what your rights are. Most importantly, you should speak up when you’re treated unfairly, when you are not receiving the support you are entitled to, or when you are being asked questions or assigned tasks that are unreasonable or straight-up discriminatory. Knowing your job description, what your responsibilities are (and are not), and what pay or compensation you are entitled to will help you defend your rights. There are some things interviewers should not be asking you about. Sometimes people break the rules, by asking about your family or whether you have children, so it’s important to know that you have the right to not answer questions. For a college admissions interview you should contact the school’s administration if you think you’ve been treated unfairly. In a job interview, you’ll want to contact a manager or supervisor of the person who interviewed you. Check out this guide for more information about your rights during a job search. Knowing your rights is helpful, but defending them and fighting for them can be hard or scary! Check out Legal Services at Mazzoni for help and advice, particularly as it pertains to discrimination based on sexual orientation or gender identity. For the time being, free-market capitalism is what queer and trans people have to deal with, and that means that most of us will need to find jobs in order to continue transmitting queer radiance. If you’re someone that likes to think about alternative ways to exist in the world, check out Queer Survival Economies.